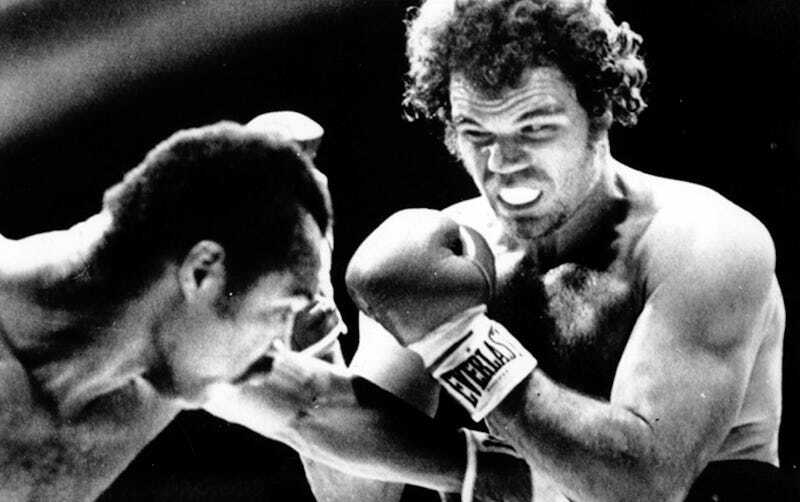 Here's the second of four Pete Dexter columns about Randall "Tex" Cobb's heavyweight title fight against Larry Holmes. Click here for part one. Originally published Nov. 24, 1982, as "Gifts Aren't Everything" in the Philadelphia Daily News, this column appears here with the author's permission. HOUSTON—On the last day of work before he meets Larry Holmes for the heavyweight championship of the world, Randall Cobb sparred three rounds with a light heavyweight named Charlie Singleton and then spent 10 or 15 minutes jumping rope. I can't tell you exactly how long because Randall jumping rope is something I can't make myself watch. I don't know why, but rope doesn't fit under his feet. As Charlie Singleton says, "Maybe Tex don't have all the natural gifts. He didn't get no fast left hand like Larry, he didn't get no bouncy legs." But as Charlie Singleton also says, "Maybe he got some gifts that was more subtle, and maybe he got some gifts that he give himself." For natural gifts, all you have to do is look at the undercard for Friday's fight. Greg Page versus James "Quick" Tillis. Leg speed, hand speed, reflexes. You can't help thinking of the destruction Randall could do with that stuff. Tillis, as a matter of fact, not only jumps rope, he does rope tricks. In fact right after the workout, he lassoed Randall's trainer and then Inquirer sports writer Thom Greer. Quick Tillis always carries a pink lasso. But impressive as that is, Quick Tillis gave away his shot against WBA heavyweight champion Mike Weaver last year when he got in the ring and refused to get close enough to Weaver to throw punches. And Page took himself out of consideration for a championship fight about the same time, saying he wasn't ready, and then proved it by losing to a Canadian named Trevor Berbick on the undercard of the Holmes/Gerry Cooney fight earlier this year. Berbick doesn't have even as many natural gifts as Randall. So in boxing, like anyplace else, gifts aren't everything, and the kind you give yourself are the ones that matter most, at least at this level. Which is not to say Randall Cobb doesn't have physical tools. He does, but—as Charlie Singleton puts it—they're subtle. He is stronger than any heavyweight in the top 10, and he may have the best chin in the history of boxing. And while he doen't have a single big punch, he is what is called heavy handed. "Sometime you box with him a round or two, the punches don't stun you," Charlie said, "they just feel heavy. I mean like somebody put a weight on you every time they land. It don't matter if it's on the arm or the shoulder, it still has that weight. "And you don't think he's hurt you, and then after 'bout four rounds, suddenly you can't move no more. He throws that nice relaxed way, it don't look like nothin', and then suddenly it's broke you up inside. " The reason Randall is fighting Larry Holmes, though, isn't his chin and it isn't his strength. He's gotten where he is because he tries. “He got that heart," Charlie said. Holmes has some of that too. And one of the best jabs in history, and a good right hand. He doesn't have anything that can take Randall out, though, and Randall won't be waiting for him to set up and throw his punches. And Holmes has always needed time to set up. And in the end that's what it will come down to. Time and heart. And those aren't things that you're given, they are things that you make for yourself. Holmes doesn't believe Randall can throw 100 punches a round for more than four rounds. Randall does believe it. And that is something he has given himself too. He believes he will win this fight, and he believes in things harder than other people do. I have known him a long time, and that's the way he is. He believes it now, and he will believe it going into the 10th round, or the 12th, or however long the fight goes. By that time Larry Holmes will have hit him with everything he can hit him with, he will have tried every trick he knows, and most of them will have worked. And someplace in the fight—maybe deep into the fight—Holmes will begin to feel the weight of that belief, and finally, as Mr. Singleton says, he will realize he's broke up inside. And someplace in the fight, Larry Holmes will come to believe it too.